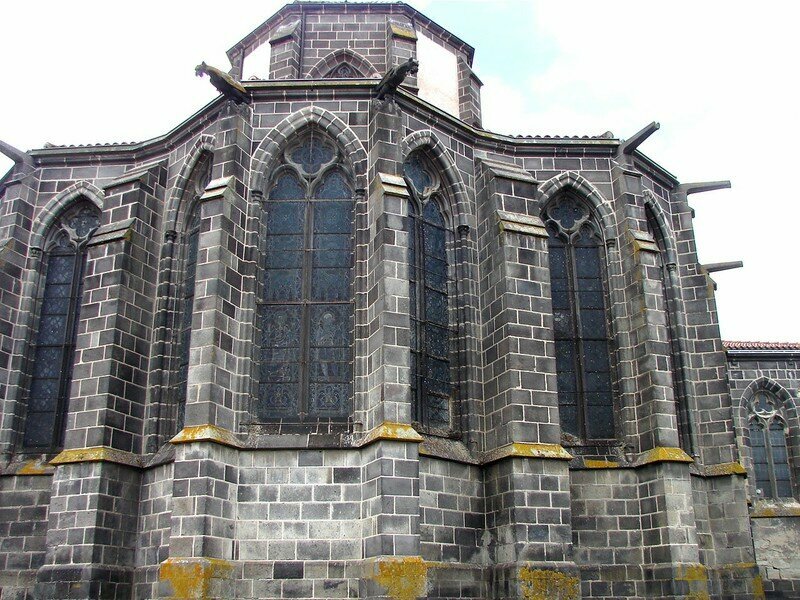 Placed under the patronnage of two Syrian martyrs, holy Victor and holy Crown, the church of Ennezat, that its dimensions and its site made it call the cathedral of the marshes, offer this characteristic which strikes with the first glance, to be semi-Romance semi-Gothic script. 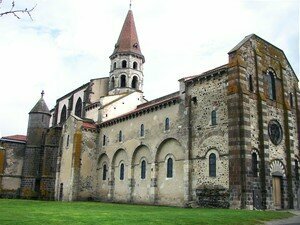 It is built out of arkose for the Romance part, in andesite for the gothic script. 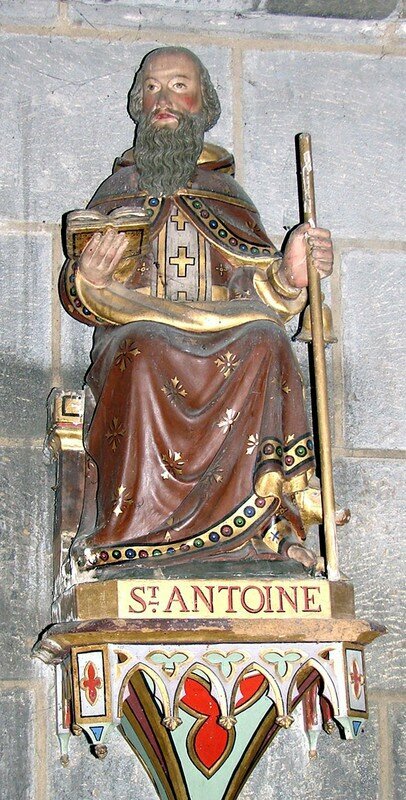 In Ennezat was rested by Guillaume VI of Aquitaine, count d' Auvergne, under the pontificate of Alexandre II (1061-1073) a chapter of 12 regular canons. It is undoubtedly at once after the construction of their church was undertaken, in the style of then, the novel. 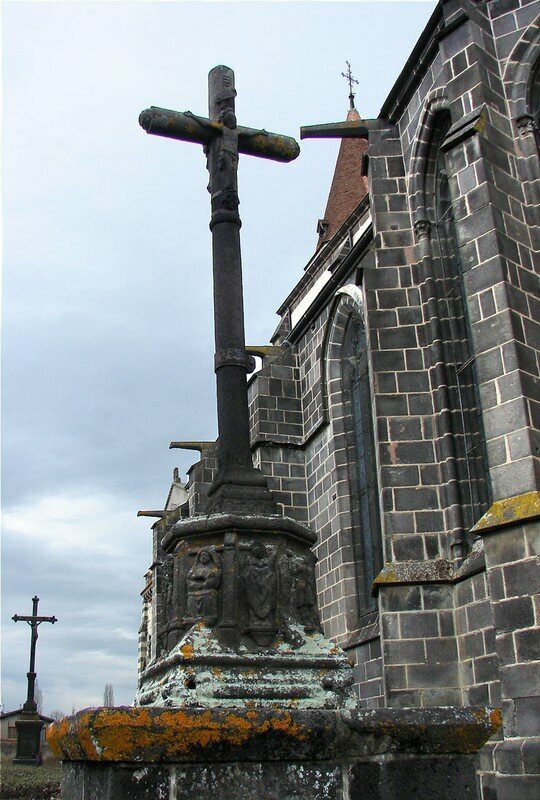 Towards the end of XIIème century, the canons were ammenés to increase their collegial. 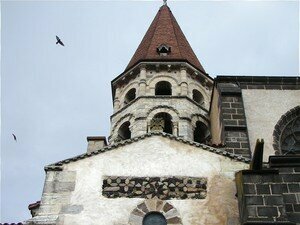 They undertook to rebuild it entirely in the Gothic style, but only the chorus was rebuilt. The architecture of the nave and the transept of the Romance church is particularly remarkable: “one of the most beautiful things than one can see in Auvergne”, “one of the chiefs of Romance work of art” say the archaeologists who most recently studied this church. 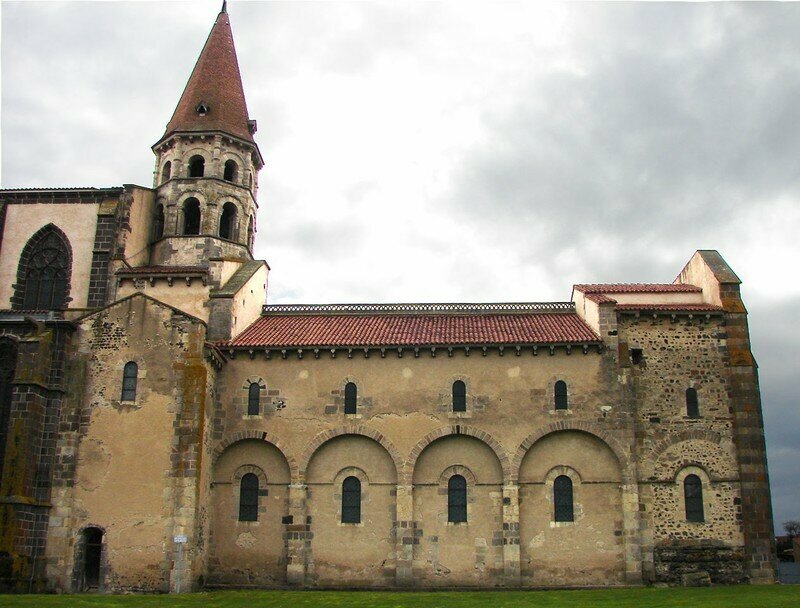 It is noted there that, as of the end of XIème century, the Romanesque art auvergnat had developed the data on which will be built the churches of the Notre-Dame type of the Port. 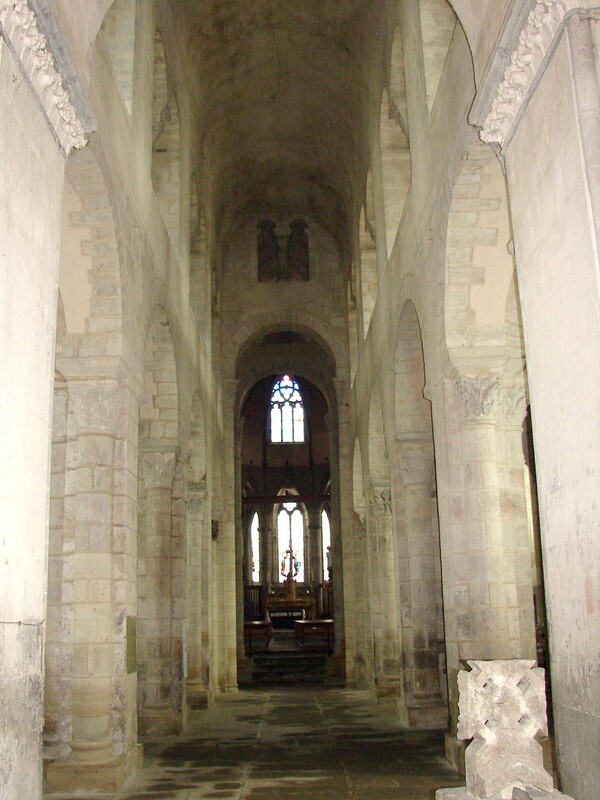 In spite of its small dimensions (nave: length 18,17m, width 3,75m, height under vault 13,30m, low sides width 2m, height 6,20m), architecture is of completely monumental aspect. 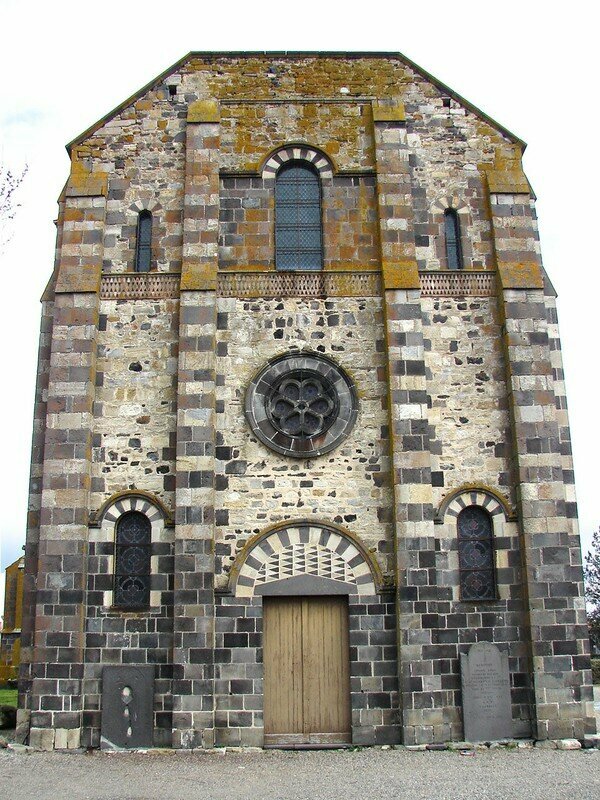 The church has an axis deviated slightly towards south-east from where its unequal connection with the Western part. 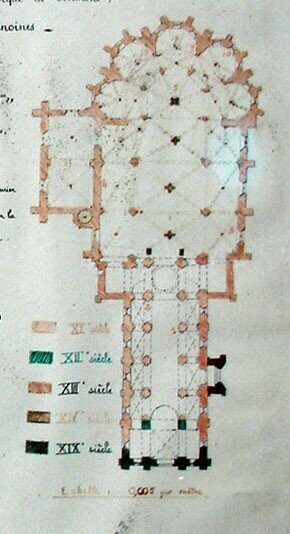 Outside, it is the bell-tower and the small solid mass which supports it which offers the most interest, the remainder having been very modified. 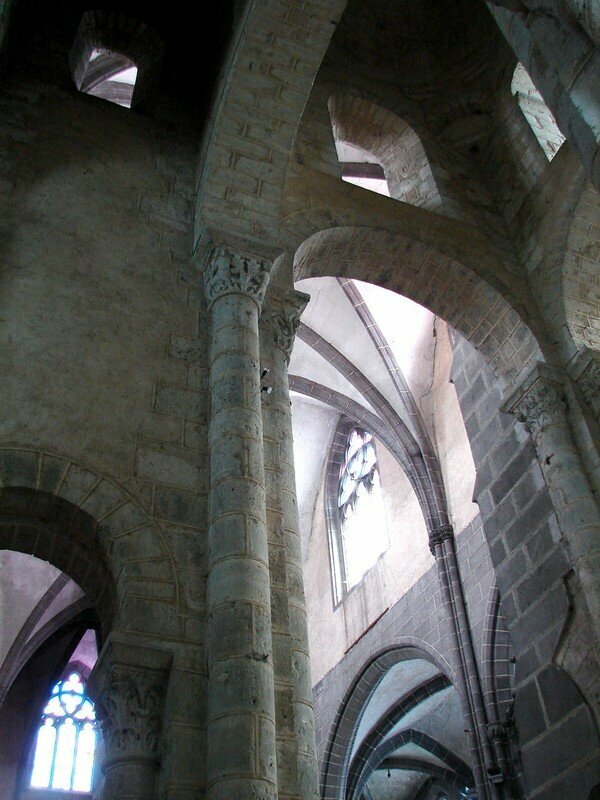 The Gothic part (length 31m, width of the nave 5m, height of the vault of nave 17,50m, the chorus 16m) is not without interest. 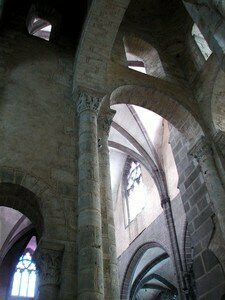 It is composed of a nave with three right spans àvec side. The bedside, seen outside, of a beautiful effect, is not without pointing out that of the cathedral of Clermont, built before. 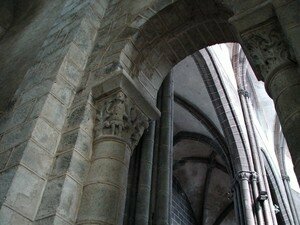 The two frescos which decorate this part are the greatest attraction. 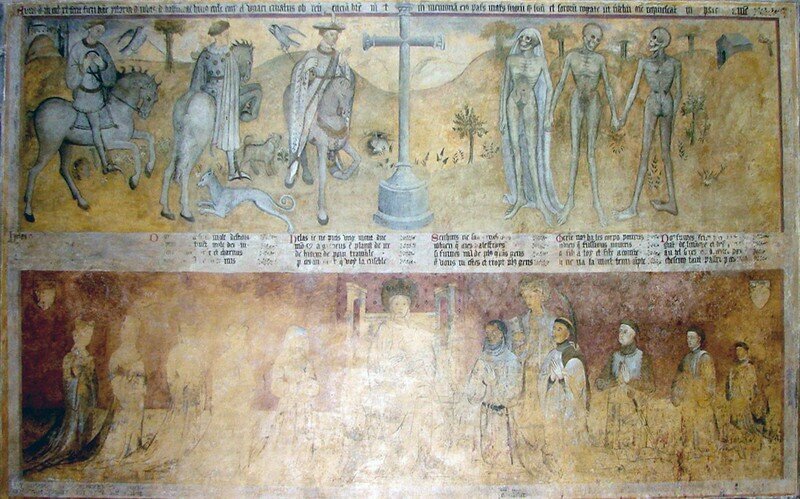 On the left, a fresco of 1420, which represents the meeting held on the three dead ones and the three sharp ones. Three lords with horse, going to hunting, see other side of a cross, placed at the center of the scene, three quelettes wrapped in a shroud. 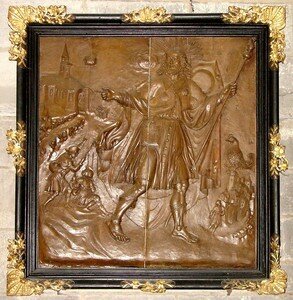 A poem, difficult to read gives the morals of this history: “each one must pass by this step”. 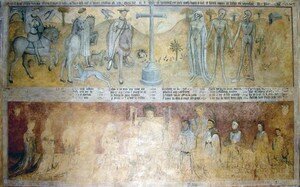 In the first span of the collateral right, a fresco of 1405 represents the last judgement. In the center, Christ accompanied by the virgin and saints, on her line the paradise with her elected officials with crénaux, on her left the hell, large mouth open where is engulfed damnés that torment the demons. 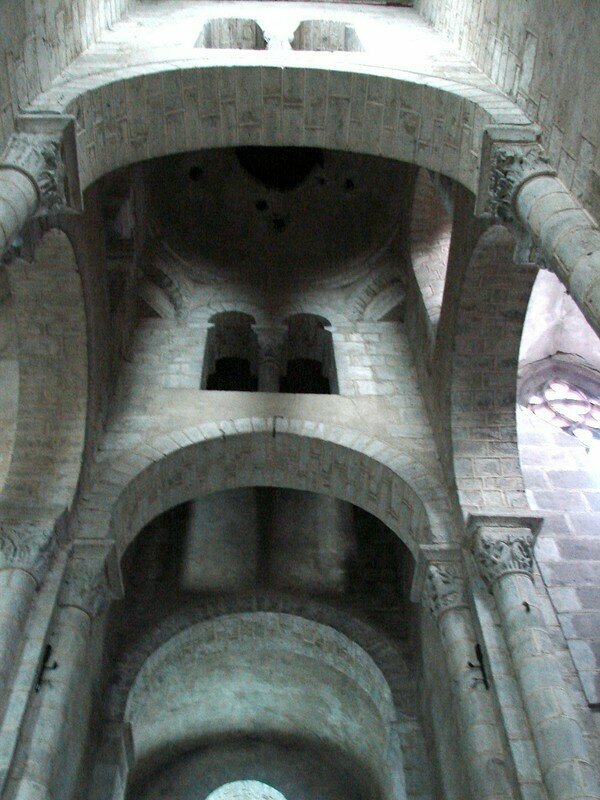 In bottom, scene of resurrection and inscriptions: “Make well while you live, because after death will not have no friends”. 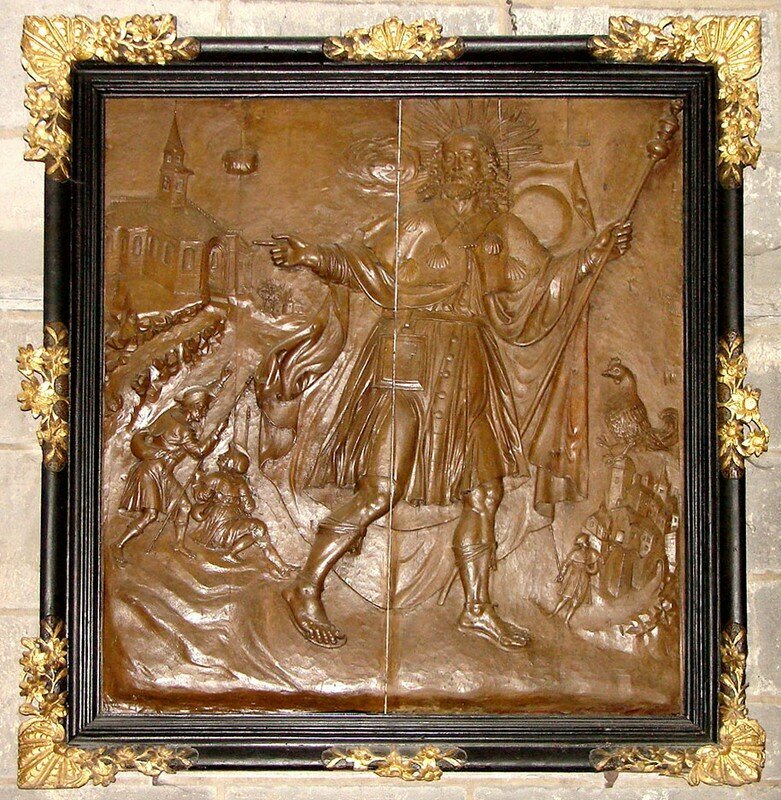 Among the mobolier, carved wood a panel, XVIIème century, represents holy Jacques equipped in pélerin, guiding those which go to compostelle. 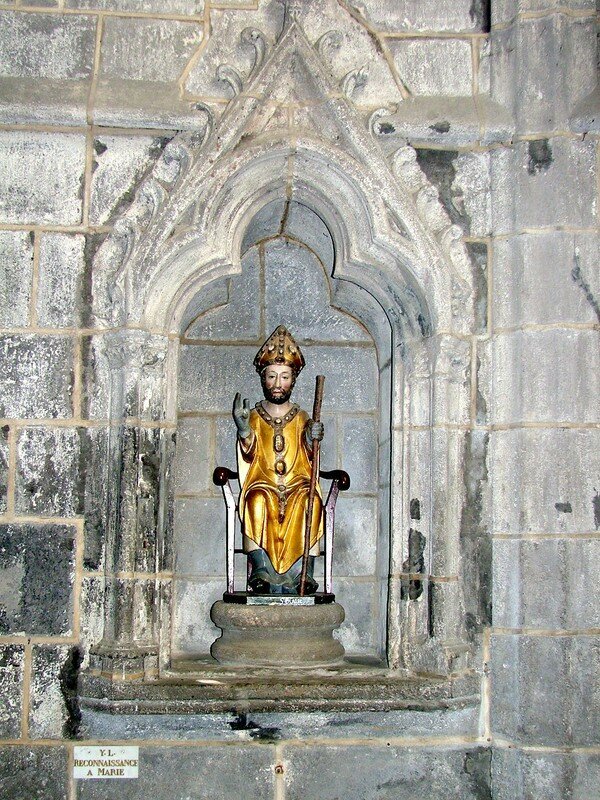 A portable statue of Saint Blaise in costume of bishop with cabochons of glass. An expressive piéta of the XVIIème century, and several very coloured statues. 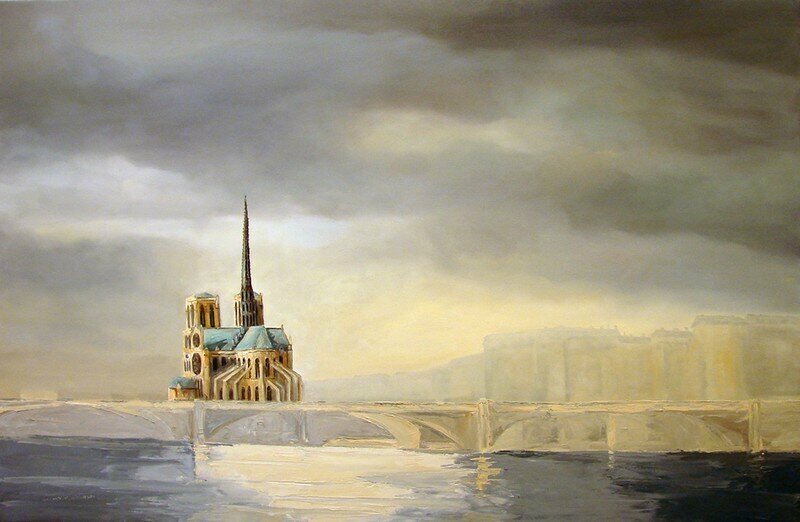 torment of the miserly one. It carries its purse to the neck. With its feet, the ground pot where was its treasure. On the streamer: CANDO USURAM ACCEPISTI OPERATED MEA FECISTI: “as a practitioner wear, it is for me that you work”. 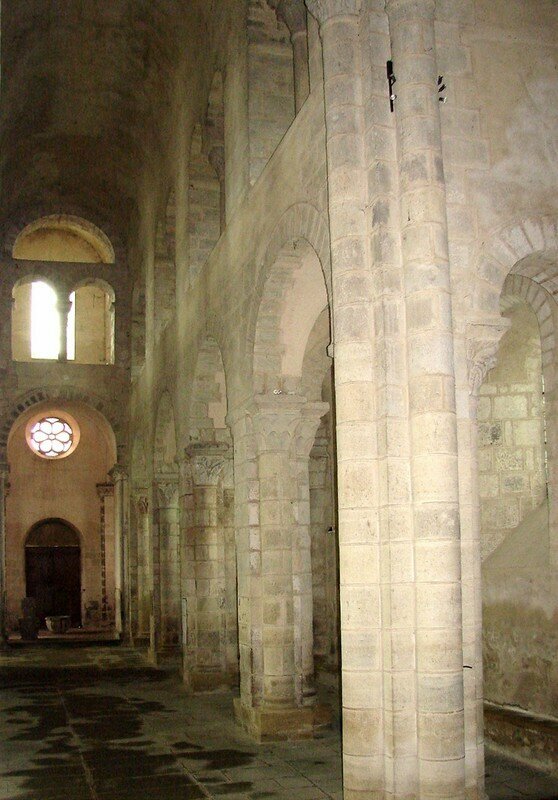 Composed of two rooms and a platform, this narthex was surmounted by a square tower before being altered. It is not full foot with the remainder of the church, being elevated of a walk. 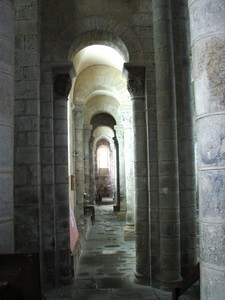 The central room is covered with a vault higher than in Notre-Dame of the Port at the level of the platforms. The side rooms are arched in cradle transverse slightly flattened. 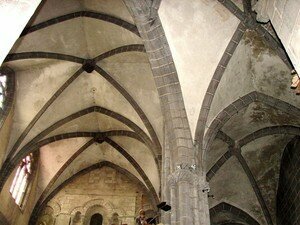 the central vault, in trapezoid, has a width of 3,15m in the west and 3,70m in the east. 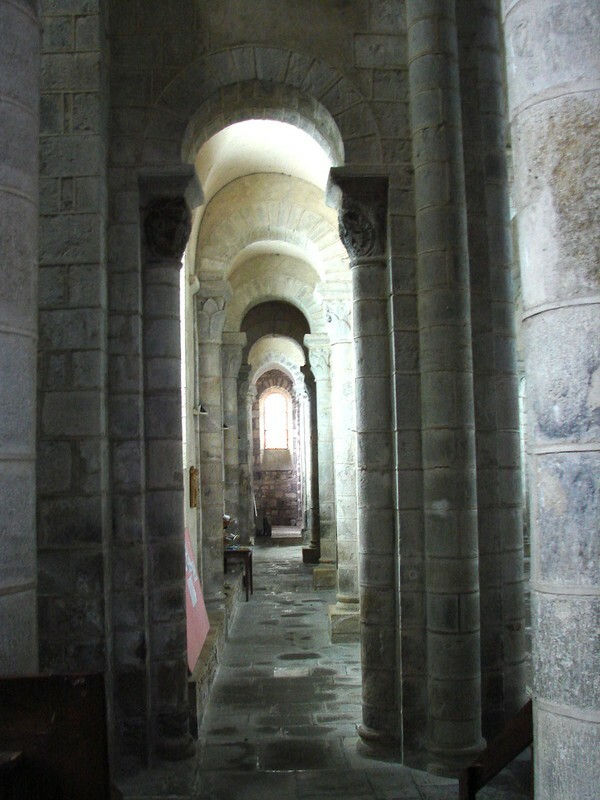 At the end of XIIème century, the narthex was altered to increase the church. 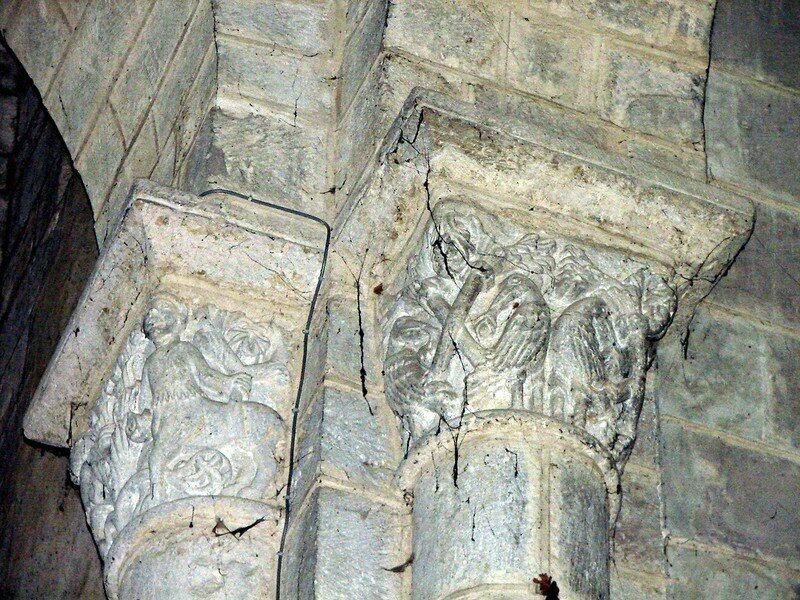 The capitals of this Romance part are in general decorated with simple water sheets. The stage of the platforms is remarkable. With the top of each arcade two geminated bays of a sober and perfect drawing open. 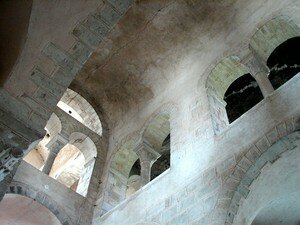 They do not carry any mouluration making covered on the walls. 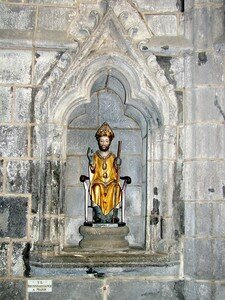 Their archstones are extradited and the portions of wall ranging between each platform are in large apparatus. They are divided into as many spans as the nave. The groined vaults present the curious artifice of construction which one finds in the large buildings auvergnats, and whose model of Ennezat offers the primitive model. The a little long groined vault on barlong plan being difficult to establish, one made it fall down on a transom in the wall leaving it on a small rectangle supplemented by a voutin in cradle in the east and the west. 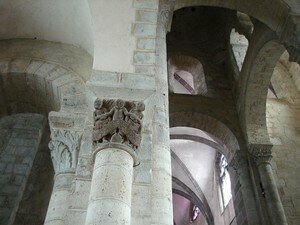 The southern side has a capital with two sirens with the angles. It is in semicircular arch and glaze of a beautiful continuous cradle of blocking whose birth is shown by no moulding. 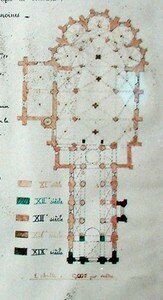 It is a plan in trapezoid, the width varying between the narthex and the transept of 3,75 with 3,51m. 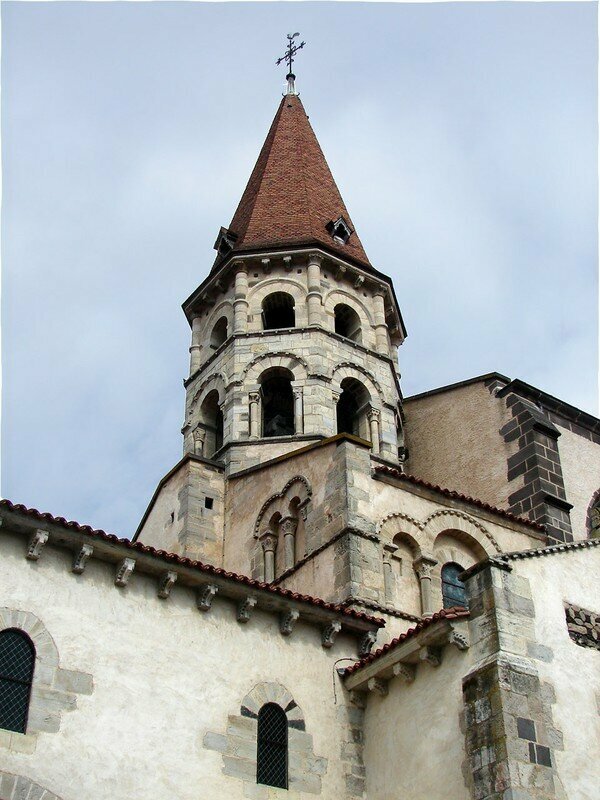 It is a process which makes it possible to increase the prospect and gives a greater solidity to the bell-tower. 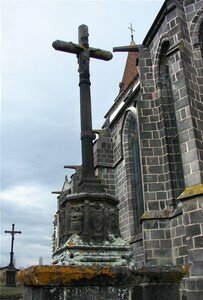 It is regular and narrow. Of a depth of 4,05m, its width is of 17m. Five compartments dividing it, crossing is overcome by a flanked cupola of two sides arched in quadrant and pilot wheels arched in cradle. 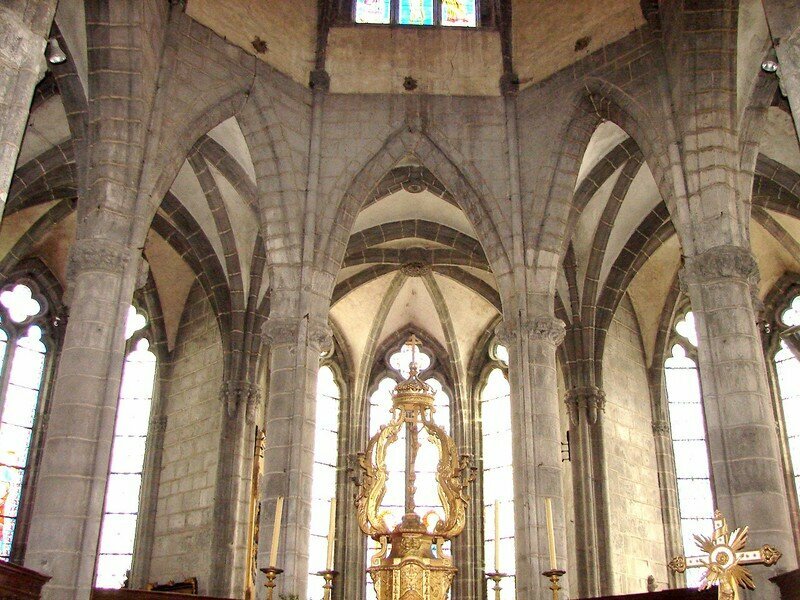 Hexagonal, it is covered by a ribbed vault to 6 branches. Only one window the celandine. Its higher stage is in blocking.